Supporters of WikiLeaks founder Julian Assange stand outside of the Ecuadorian embassy as Assange addresses the media, in London, May 19, 2017. U.N. rights experts called on British authorities Friday to allow WikiLeaks founder Julian Assange to leave the Ecuador embassy in London without fear of arrest or extradition. The U.N. Working Group on Arbitrary Detention reiterated its finding published in February 2016 that Assange had been de facto unlawfully held without charge in the embassy, where he has now been holed up for more than six years. He initially took asylum to avoid being extradited to Sweden, where authorities wanted to question him as part of a sexual assault investigation. That investigation was dropped. Assange, whose website published thousands of classified U.S. government documents, denied the Sweden allegations, saying the charge was a ploy that would eventually take him to the United States where prosecutors are preparing to pursue a criminal case against him. Britain says Assange will be arrested for skipping bail if he leaves the embassy, but that any sentence would not exceed six months, if convicted. It had no immediate comment on the experts’ call, but in June, foreign office minister Alan Duncan said Assange would be treated humanely and properly. “The only ground remaining for Mr. Assange’s continued deprivation of liberty is a bail violation in the UK, which is, objectively, a minor offense that cannot post facto justify the more than six years confinement that he has been subjected to since he sought asylum in the Embassy of Ecuador,” the U.N. experts said in a statement. “It is time that Mr. Assange, who has already paid a high price for peacefully exercising his rights to freedom of opinion, expression and information, and to promote the right to truth in the public interest, recovers his freedom,” they said. 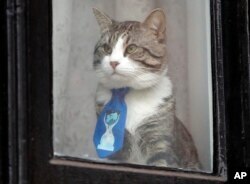 FILE - A cat believed to be owned by WikiLeaks founder Julian Assange wears a tie as it looks out of a window at the Ecuadorian embassy in London, Jan. 26, 2018. The experts voiced concern that his “deprivation of liberty” was undermining his health and could “endanger his life” given the disproportionate amount of anxiety that has entailed. Ecuador in October imposed new rules requiring him to receive routine medical exams, following concern he was not getting the medical attention he needed. The rules also ordered him to pay medical and phone bills and clean up after his cat. Assange has sued Ecuador, arguing the rules violate his rights. An Ecuadorean court on Friday upheld a prior ruling dismissing Assange’s suit. “We have lost again,” said Carlos Povedo, Assange’s attorney in Ecuador, adding that the legal team would consider bringing a case to the Inter-American Court of Human Rights.